These are available in multiple models and make. Logo can be customized as per the standards. To carry easy and air thight& liquid tight. 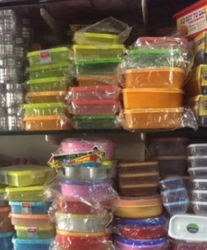 Tupperware the branded item in kitchen storage for good health and for good looking. Square Away - Convenient; handy size 2 Tropical cups - Airtight and Liquid-tight containers which allows you to pack a complete, wholesome meal. Tumbler - liquid tight. 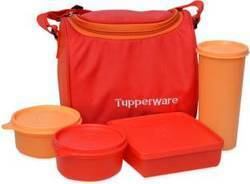 Best Lunch bag - Smart spacious lunch kit; can carry an additional spoon, napkin or any other important items.